Some big help for selecting your next website provider. Learn how to plan, assess and choose the right CMS and website partner that’s a good fit for your school or district. 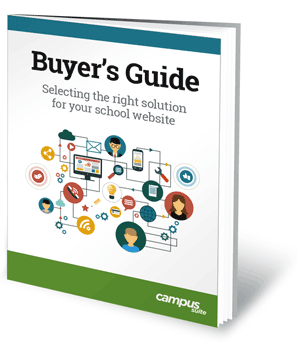 For anyone involved in selecting a website provider, this CMS Buyer’s Guide for Schools will help steer the process for your school or district. Learn how to set goals for your website, evaluate website vendors, and make the best decision for building better connections to your entire school community. If you want to talk, get pricing, or see Campus Suite in action, we're ready whenever you are. © 2018 Campus Suite. All Rights Reserved.